I have seen the phrase Design Thinking cropping up a lot all over the place recently and yet no one seems to be able to tell me what it is. So on Wednesday evening I went up to London to the beautiful new General Assembly campus for their Design Thinking Workshop to find out more. One of the benefits to being a GA alumni is that they offer a discount on courses and workshops you attend after your main course, I aim to take full advantage of this. I went with high hopes of finding out exactly what Design Thinking is so it was a bit disappointing for our tutor Nirish Shakya to start off by saying he did not have a firm definition to put up on the screen. 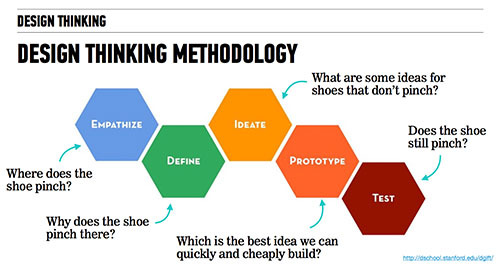 However he did explain that Design Thinking is not just about thinking, it is about how we approach design to be more user focused and how we can use it to the benefit of the organisation we work for (which followed up nicely from Alan’s talk the night before at UX Bournemouth 4). This was a workshop so it was not long before the sharpies and post-it notes were out. Following the Design Thinking Methodology diagram we started by thinking about our ideal wallet, before pairing up and trying out our empathy skills by interviewing each other about our wallets and purses. These interviews were designed to help us work out what issues our partner has with their wallets so we could think about how to fix the problem. By doing two interviews each it also allowed us to go deeper and learn more. Once we had done this we then started to think about how to define the problem. At this stage we were still not supposed to be thinking about solutions, although sometimes you cannot help yourself. With the problem defined we could then ideate ideas using the worksheets provided. Interestingly when I wrote my problem statement down it came out as “Sim needs a way to use his oyster card without taking it out of his wallet because he does not want to drop everything or slow everyone down”. However when I wrote it down to start thinking about ideas I changed it slightly to “Sim needs a way to get through the tube barriers without dropping stuff or slowing everyone else down”. When I started thinking about it, it did not matter to Sim how the barriers work he just needs to get through them even when he has his hands full. His wallet is not really the issue and neither is his oyster card. This meant that when I came to think about solutions I could go much wider than I might have if I had been stuck thinking about his wallet. It is really important that we try and think of as many ideas a possible before deciding on a solution to make sure we really are working on the best design. Although I have found this more difficult outside of the classroom environment when I have stakeholders who come to me with solutions, rather than problems, or with so many constraints that only one solution will work. The workshop was attended by a wide range of people from designers like myself to people who work with design teams and want to learn more about their processes, which meant I felt it could have gone a bit deeper, but was probably at just the right level for most of the people attending. It was an interesting session which confirmed that I am using the right approach in my day to day work. Maybe I do know what I am doing after all. It was also great to have things reconfirmed for me and the reassurance that Design Thinking is nothing scary, it is just working through the process.